A few weeks ago I decided that I wanted to start my own little online shop! I always find it hard to find reasonably priced and stylish rings on the highstreet. So after a little conversation with Victoria I decided I was going to give this jewellery selling a go again. I used to have a myspace jewellery business when I was 16, Selling those hideous oversized plastic diamonds, knuckle dusters and ribcage necklaces! The shop doesnt have a name, I'm rubbish with naming things so its just Shop LLYMLRS for the moment. But I will get my thinking cap on and try and think of a proper "brand" name! The basic plan at the moment is to just stock rings (because they are my favourite type of jewellery!) and keep it as resonably priced and on trend! and by on trend I pretty much mean "stuff that I like"! These cross rings are smaller than the infamous Asos/Forever 21 ones! But they are size adjustable so those with smaller/bigger fingers can adjust accordingly. They cost £6 and then P&P depending where you live in the world! I ship worldwide! Also I'm still sourcing new items for the shop, so if you have any ideas about the types of rings you like leave it in the comments and I'll see what I can do. I've got these lush oversized turquoise stone rings on the way which I cant wait to show you! EDIT: All the rings sold out within the first 24 hours. Im so overwhelmed with the response and Im really sorry if you've missed out. Im leaving the item up in the shop for PRE ORDER. Which basically means when the items come into stock I will ship them. It should take 7-10 days for a restock though. I will try and keep stock levels regular, but like I said, I didnt expect so much so quickly! PS. DISCLAIMER: I wont be bombarding you with posts about my own jewellery. I am happy and proud of what I'm doing but I'm not gonna shove a brand down your throat, even if it is my own label! Oh! I've been looking for rings like these forever! I couldn't find them anywhere and Asos was sold out! PERFECT! I think it's a lovely idea, it's about time there was somewhere with on trend rings at reasonable prices. I've been wanting a big turqouise stone ring for a while so hopefully this will be the one! 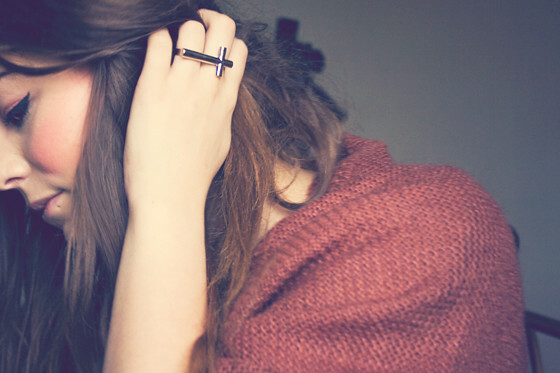 Oh gosh, I've been coveting your cross ring for so long and haven't been able to find one I like as much! You have no idea how excited I am! So happy you ship to the States too! What a great idea. I will be sure to check it out. I was just searching on ebay for these perfect rings! And the turquoise ones, which I'm very curious about. I also like the rings with the skulls and the ring with the snakes :). And the claw bracelet! I'm so in love with the colour of your cardigan and that ring looks faboulus (but sadly I just bought some rings of asos.. grr)! they are so mini and cute! I love them. I think the ASOS ones were too big, so these are just perfect! love it. roll on payday! Such a good idea! So pleased you're doing this. Loved your cross ring you featured in an older post, so glad this is your first one! And that it's adjustable, great for my stubby fingers! somehow the checkout at your shop doesnt work.. tried to purchase the ring but yea I couldnt would love to have it tho..
looking forward hearin from you! yeah cute idea hon! if i had more money id defo get one! liking the sounds of turquoise oversize ring!! May have to purchase one!!! 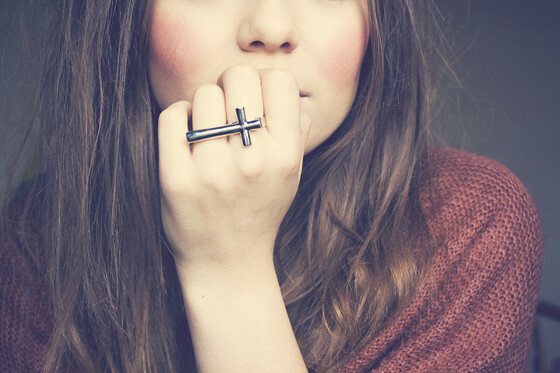 This is a great idea - I love the cross ring and would definitely buy one if I didn't already have one! Can't wait to see this turquoise one, I have been wanting one for agesss! good luck with the business lily! awhh man , supposed to not be buying stuff but these are so much better than the asos ones!! Im just a new visitor, and I really liked your pics. I hope you visit my blog back. cool! I like the rings a lot! you are soo verry pretty as well! I love your blog. You're such a pretty lady. Can't wait for your cross rings to be restocked and I'm also curious about the turquoise stone rings! That's so cool you are opening your own shop. I hope it does well! It seems like your off to a great start. I really like that these are not just ajustable to your finger sizes, but that they're a bit smaller than your average cross ring that you come across in stores! So yes, I truly love these! I tried to do the pre-order and it froze on me and didn't work. I tweeted you about it but I'm sure you get a bajillion tweets a day so I figured I'd let you know in two different places. Awesome idea though, I'll totally be placing an order as soon as more are shipped to you! I love double rings, but I don't own any! I like the ones with feathers and words..
this idea is so clever ! i bought a cross ring from asos and find it hard to wear becasue it only fits one finger, bit of a problem ! you should make a formspring account! by the way, you had a blackberry, hadn't you? did you like it? i'm thinking about having one. That's awesome, can't wait for some more stuff from you! And don't worry about telling us about it all the time! That's so awesome you have your own shop now, I'm pretty excited. Can't wait to see what else is in store, the adjustable cross ring is a great debut. I wish you luck with your new business, but as I see you don't need it. Everything sold out, wow!! oo I love the idea of having your own shop, I'm sure it will be fabulous! If I have any money left after my trip to London, I'll definitely be ordering. I love how the ring is adjustable too, I have giant hands & find it so hard to get rings, especially double finger ones! I simply adore this ring! bagaimana cara mengobati wasir luar secara alami?